Community involvement in the Cary House Historic Renovation project was overwhelming. Well over 600 hours of volunteer efforts were given by church groups, youth groups, and individuals. In addition, financial support came in via Foundation grants, financial institutions, businesses and individuals. This represented a strong interest behind the historic renovation of this grand and important Millersburg residence. 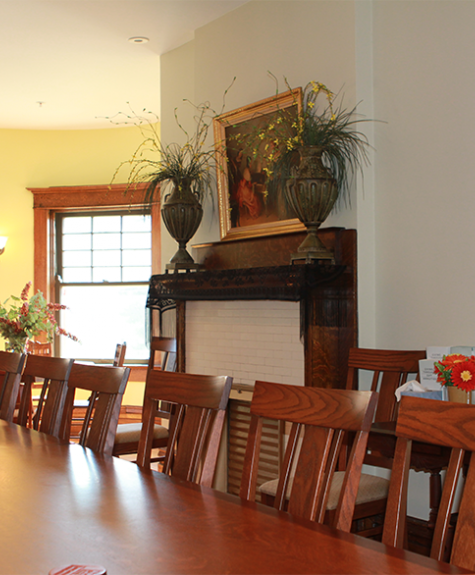 The second floor meeting room is available for groups to meet and seats 20 people. There is no fee to use the meeting room. The room is accessible via stairs or elevator. Submit the form below to request the usage of the meeting room. By providing an accessible, central, convenient location and essentially giving a national historic landmark back to the community for the promotion of education- indeed for the promotion of the community itself- the Cary House will help to ensure a promising future for Holmes County and its residents. Wireless internet is available in the meeting room. Please contact the Administrative Assistant for more information. (Please make sure room is clean and trash is taken with you.) Turn off all lights and make sure doors are locked.